In the south eastern edge of Peloponnese, just before the unique rocky landscape of Laconic Mani, there is an almost medieval town that appears to have emerged from the shadows, the island of Monemvasia. In a mood of some history? Its name is the combination of the greek words “moni” (=church) and “emvasi” (=the only entrance), Monemvasia is linked to the mainland by a 2 kilometer bridge that was built in 1971. Having a magical historic past that goes far back into the depths of history, Monemvasia was well known to the ancient Greeks. However its prosperity rose significantly during the Byzantine ages, as the fortress was built as a attempt of the locals to protect their city from the Avaric and Slavic invaders. Gradually the castle town became a center of flourishing economy, mainly due to the exportation of the notorious Malmsey wine, a wine variety that has become famous ever since. The port continued its thriving course in the early Renaissance years, even after the island had passed over to the hands of the Venetians, in the 16th century. However, the commercial activity begun to decline after the Ottoman enforcement in the 17th century and continued until the liberation of Monemvasia in 1821. 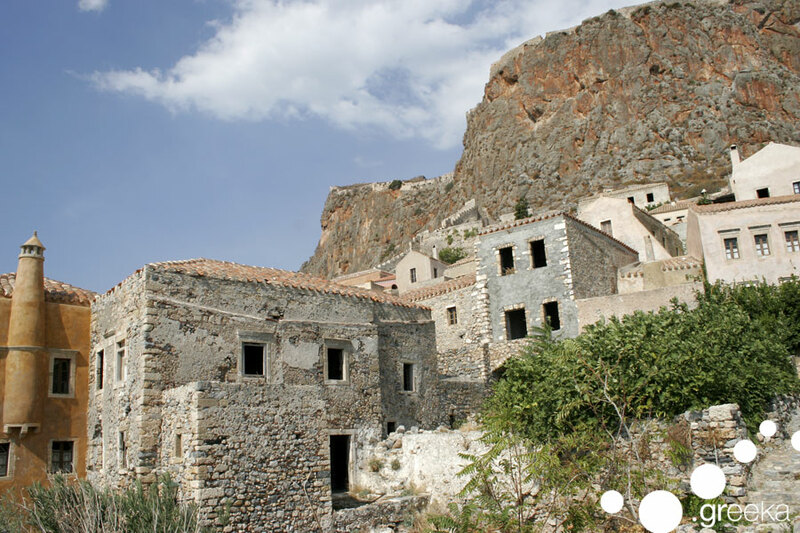 Nowadays, Monemvasia still echoes its former glory. It is, hands down, considered as one of the most characteristic architectural remains of the Medieval era in Greece. As the huge fortress unfolds to the wondering eyes of the visitor, the venetian buildings, the narrow, stony backstreets, the small arcs and the tiny yards are telling the story of another era. 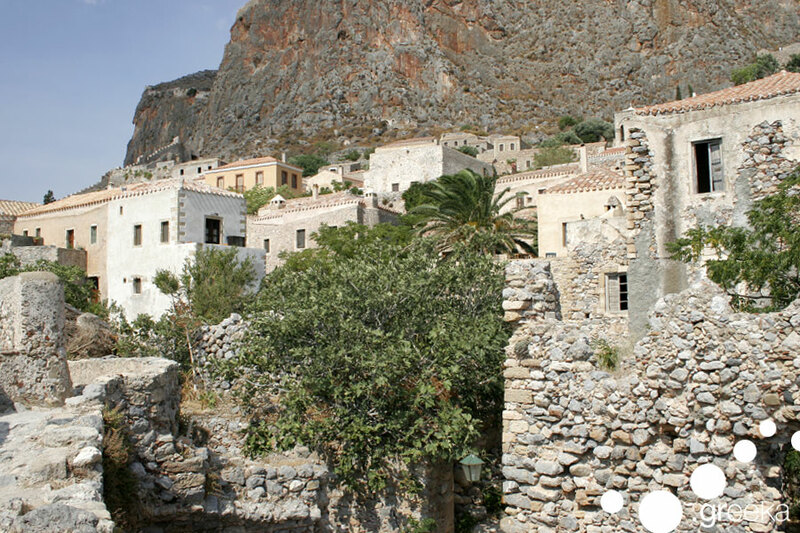 Since the building of new-age edifices has been forbidden, Monemvasia has preserved its unique, traditional style. Therefore, visitors can have a first-hand experience of the medieval atmosphere. All accommodations blend the traditional element, having high quality facilities that will make your stay unforgettable. Monemvasia is a living monument of Byzantine history and therefore one must visit the marvellous churches that date back to the 11th century. A brilliant example is “Christos Elkomenos”, the metropolis of the castle in the small piazza, naked from murals but with excellent late Byzantine illustrations. A visit to ‘’Epano Kastro’’ (Upper Castle) is definitely a must, as it hosts the remains of the old town including the churches of Panagia Mirtidiotisa and the majestic Agia Sofia. ‘’Portelo’’ is a small arc next to the sea fortress that offers a relaxing walk by the sea, with a breathtaking view to the endless blue of the Aegean Sea. Moreover, near the main entrance of the castle is also the house of the famous Greek poet, Yiannis Ritsos. A small trip to the castle town of Mistras, next to the city of Sparti is also worth it. Apart from its rich historic profile, Monemvasia has a variety of modern shops, cafes and bars, ready to offer relaxing moments to the visitors that are getting more and more as the years go by. Don’t miss the opportunity to taste the traditional delicacies made of local products, such as the traditional ‘’amigdalota’’ (delicious almond sweets) and the world-famous Malvasia wine. Last but not least, don’t forget to drop by the famous Emvasis bar for mouth-watering cocktails and spectacular, picturesque night views! Are you still thinking about it? Monemvasia waits you for the most unique medieval experience… These photos will definitely convince you!